KCAP, the firm responsible for the development guidelines for Wijnhaveneiland, designed this housing block of 210 units at the point where Wijnhaven meets Scheepmakershaven. 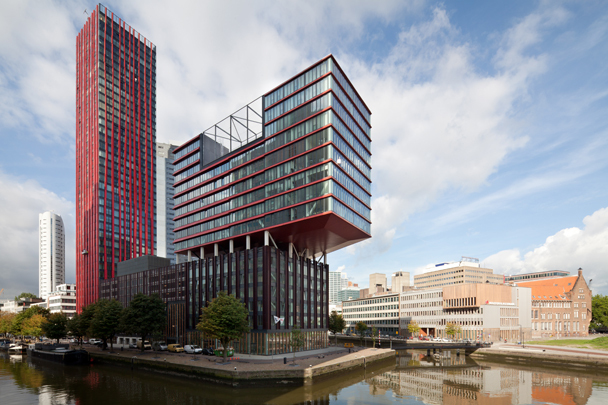 The Red Apple combines a slender tower 120 metres tall and a low cantilevering wedge of housing round an atrium. Both stand on a ‘plinth’ of shops, office space and indoor parking. Anodized aluminium bars rising up the tower’s exterior narrow as the view becomes more spectacular. Units have full-height glazing and French balconies. The less-tall block has horizontal red elements and a communal outdoor area in each flank wall.